Microsoft Visual Studio offers a number of templates for building Windows 8 applications. In most of my postings, we’ve been using the Blank application template, but the Grid App template is extremely powerful. Unfortunately, it is not obvious how to adapt it to your own data and it doesn’t come with an instruction manual. This posting will show you how to substitute your own data for the design-time data that comes out of the box. We will keep the design time data for, er, design time, and we’ll add “real” data (well, fake data) for run-time. 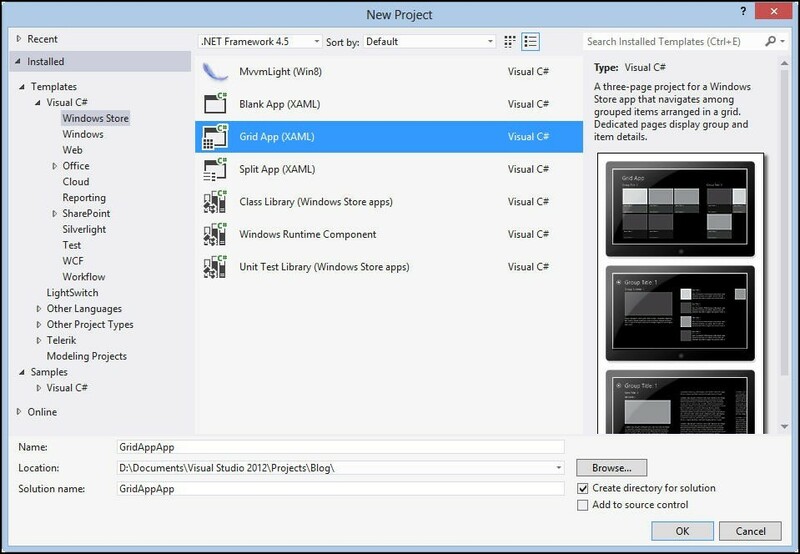 The first step is to fire up Visual Studio and create a new application, using the Grid App (XAML) template under Visual C# Windows Store, as shown in the figure. (Click on the figure to see it full size). When Visual Studio settles down, run the application as is, right out of the box. You’ll see “design time data” displayed in three pages: the hub page, the Groups page and the Items page. Our goal is to show our own data in these pages. To do so, we first need to find where the design time data is created. Open the DataModel folder and navigate to the constructor for the Sample Data Source. A simple way to do so is to expand the DataModel in the solution Explorer, then to expand the SampleDataSource and to click on the constructor. That will cause the editing window to navigate directly to the top of the method. Notice that this is very similar to the class we generated for working with GridView in this posting. The difference is that this time we’re going to pass in the city as a parameter. Step three is to add people to each city in turn, thereby populating the AllGroups collection. The result is a hub page with the people grouped by cities, a group page for each city and a detail page for each person. This entry was posted in Data, Essentials, Mini-Tutorial, Windows 8 and tagged Mini-Tutorial. Bookmark the permalink. I was more than happy to seek out this net-site.I wished to thanks for your time for this excellent read!! I undoubtedly having fun with every little bit of it and I have you bookmarked to check out new stuff you weblog post.